Looking for the perfect outdoor table? 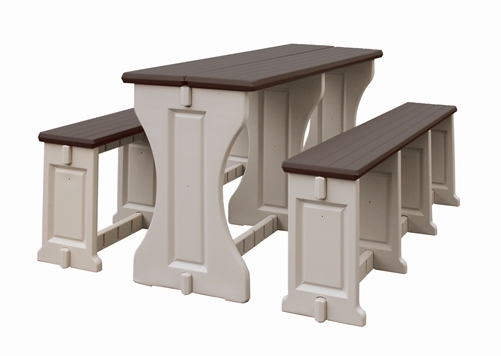 Our beautiful Leisure Accents Picnic Table comes in your choice of four great colors to complement any decor. Ideal for use beside the spa or pool, on the deck, in the backyard or on the dock at the lake. Now you can enjoy outdoor dining in style! Two sturdy, matching benches are included. Quality crafted from carefree resin for lasting good looks, right here in the USA. Unlike wooden tables which will crack, splinter, and rot, this Leisure Accents picnic table stays beautiful year after year without constant maintenance. Lightweight, durable, and maintenance-free…unlike wood!